if you hear the sounds of metal scraping against metal, run as far away as you can from it. if you see what's making the noise, run even faster. don't try to attack it. Don't make any trouble while you're here. There's a group of businesses looking to hire people in the square with the guillotine, if you're interested. I'm going to be guarding a scarecrow field. They made a big deal about there being no "hazard pay" so. Uh. Keep on, creeping on, I guess. How was everyone's first night? The asylum's pretty much just like you'd expect. Aslyum-y. I woke up and there was a straightjacket on my bed that definitely wasn't there last night, and it was absolutely freezing this morning, but I survived the night. Anya's cheeses smell worse than the plumbing. It could always be worse. I haven't said who I was. My name's Buffy Summers. I'm a vampire slayer. I'm not looking to start anything; I know there are always... exceptions. But I'm not going to stand by while innocent people are hurt. If you think you're in trouble, come to me. Trouble and I are BFF. Unto those high joys which she holds from me? It is no use. I find no joy in singing to a book. All of this foolishness is far too distracting, in any regard. Quiet, the lot of you, lest you wish to join my merry band of goblins. I could certainly put you to work. you know, the forest here is a little like the brecelian forest! if the brecelian forest was darker and had some very odd looking mushrooms growing on some of the trees. 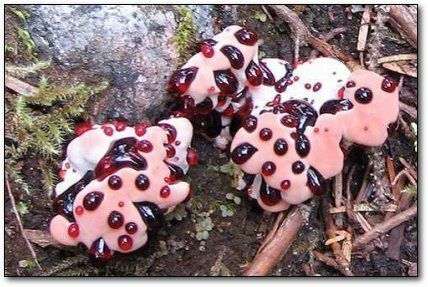 i wouldn't eat any of the red mushrooms on the trees, by the way. i'm not an expert when it comes to mushrooms, but they seem off to me. Well, it seems like this place will have no shortage of interesting things. Alright you knuckle-dragging freaks. PAY ATTENTION. Me and books, we don't get along, see? If this thing tries to eat me, I'm coming for every last one of you shitheads.